Good poblanos are tough to come by in Syracuse, N.Y.
My first encounter came at the now-shuttered La Hacienda in North Las Vegas, a taco stand where my aunt complained that the music was too damn loud to hear the waitress. I didn’t have the heart to tell her that the volume was irrelevant because the waitress didn’t speak English. The best I can come by here is El Canelo, an underrated Mexican restaurant on Bridge Street in East Syracuse. 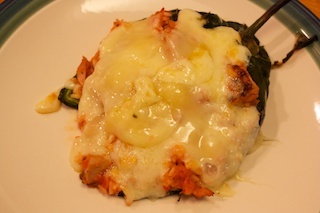 The peppers are fire-roasted, then fried, and served with melted cheese in a slightly-spicy red sauce. I like the sharper flavor of the poblano. It’s not as sweet as a bell pepper, but not as spicy as a jalapeño or other chile peppers. Tonight’s dinner was on the outer ring of Mexican food, in terms of difficulty and authenticity. Fine Cooking wouldn’t be my first stop for Mexican recipes, but I liked the idea of stuffing one of these for dinner. Position an oven rack about 4 inches from the broiler and heat the broiler on high. Line a large rimmed baking sheet with foil. Slit the chiles from stem to tip and set on the baking sheet. Broil, turning every few minutes, until blackened all over, 5 to 8 minutes. Let cool slightly, peel off the skins, and cut out the seed cores, leaving the stems on. Turn the chiles inside out, flick out any remaining seeds, and turn right side out. Return the poblanos to the baking sheet. Puree the tomatoes, onion, garlic, Sazon, cinnamon, cilantro, and 1/2 tsp. salt in a food processor. Heat the oil in a 12-inch skillet over medium heat. Add the purée and cook, stirring frequently, until the liquid has evaporated and the mixture looks thick and pulpy, 8 to 11 minutes. Stir in the lime juice about with about four minutes left to cook. Remove the pan from the heat. Stir in the chicken and rice. Season to taste with salt. Divide the filling among the peppers. Broil the peppers until the cheese melts and the top is beginning to brown, about 4-6 minutes.